And we're back! Today was the first day of school and Miss Faith's first day of first grade. It went exceptionally well and she is quite excited about learning all about ancient Egypt (their focus is on the early parts of the Old Testament this year, so tons of Egypt stuff)! 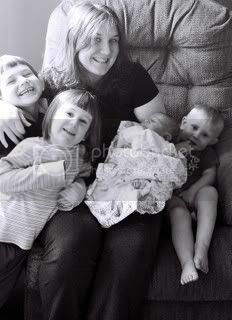 Most of her friends are back and her class has three new girls in it, so it looks likes the makings of a fun year. 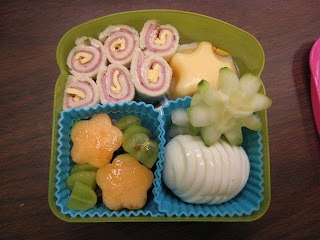 For lunch today, she took some ham and cheese faux sushis, a mango star pudding, grapes with canteloupe flowers, a boiled eggs and some cucumber flowers. She finished it all except for the pudding, which she ate in my classroom after school while waiting for me to pack up. What are these star pudding things, and where can I get them? Nice 1st day lunch! Did you make the pudding stars yourself? I was going to ask about the star puddings too. But I see some others already have. I'd love to know where you got them too! I tried to google them but didn't find anything. Thanks!